Fusion continues to keep quality and customer service at the forefront while expanding it's product offering of electrical consumable products and materials. It's through quality design and thorough testing that Fusion delivers dependable products that our customers can rely on. We at Fusion Lamps understand that the quality of light can effect the mind, the body and also give us the ability to visually perceive objects as they were intended. Lighting is a blend of art and science that is being driven by the continuous evolution of design and new technologies. There are several educational sections that can be found within this catalogue. By using these learning tools, you’ll expand your knowledge on the various facets of light and lighting. Continuing to increase your knowledge of lighting is fundamental, as different light sources can dramatically change the look and feel of a space. 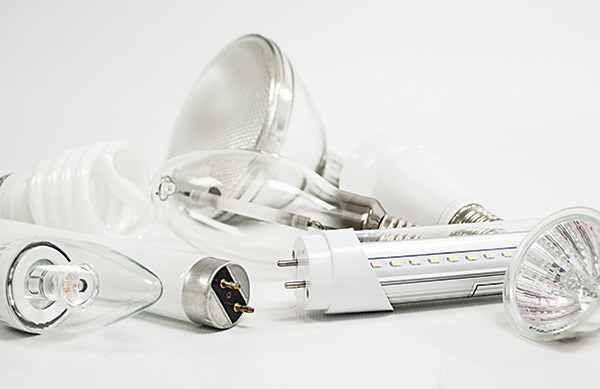 Fusion Lamps understands the importance of selecting the right light source for your unique application. This catalogue has been designed to assist you in that process, by giving you a basic knowledge of light, allowing you to choose the best lamp for your specific application. What is the colour of Light? The first factor in choosing a lamp colour is the correlated colour temperature. The CCT rating is an indication of how “warm” or “cool” the light source appears. The higher the number, the cooler the lamp colour will appear. The lower the number, the warmer the lamp colour will appear. When we look at a light source, the eye “perceives” a single colour. In reality, we are seeing literally thousands of colours and hues made up of a combination of different wavelengths of light. These different combinations and the relative intensity of various wavelengths of light are used to determine the CCT and CRI of a light source. A very warm incandescent colour. Used as a general warm, white light source, for retail or interior applications. A neutral white light source used for general lighting, factories, parking lots, warehouses. A moderately high CCT day light source used in general and retail lighting applications. 10,000K - A very high CCT, daylight light source, used in horticulture and aquarium applications. Above is a comparison test using 4 different lamps. All the same colour temp but with different CRI. You can see that as the colour rendering index goes down, so does the lamps ability to bring out rich colours in the apple. How much Lamp Life can I expect? 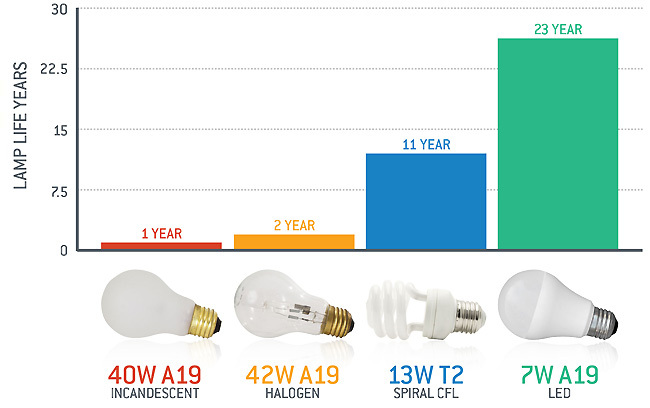 Rated Life Rated, or average (median), life for lamps is a value of lamp life expectancy based on laboratory and field tests of representative lamps, operating on approved systems, with a burn cycle of at least 10 hours per start. The average life is determined when 50% of the lamps initially installed are still operating. Various operating conditions affect lamp life. One key factor is operating position. Position-oriented lamps (designed to operate in one specific position) are tested and rated based on that designated position. Operating these lamps in any other position can dramatically shorten life, reduce lumen output and cause colour shift. Lamps designated as universal can be operated in any position; however, life expectancy and lumen output are sacrificed in certain positions. Published “rated life” for universal lamps is based on operation in the vertical position. “Rated life” for universal lamps operated horizontally is 75% of the published rating. Fusion Lamps products can be purchased exclusively from Torbram Electric Supply. With over 66 stores in Canada, we are serving areas near you.